Don’t rely on seeing a take when river fishing with nymphs or wet flies. You’ll need to develop a sixth sense to know when the trout or grayling has taken your fly. BOB CARNILL explains. EARLY autumn is my favourite time of year on the river. The leaves along the Derbyshire Derwent are acquiring those wonderful hues of brown and gold; the brown trout are becoming more hungry in preparation for spawning, and the grayling are in top condition. Water levels are generally at their lowest of the year before the arrival of the rains, so being able to read the pools and runs is even more important. Dry fly will continue to work, but now I have my nymph box at the ready. Sunk fly fishing with nymphs or wet flies is an art every bit as exacting as dry fly fishing. You need to keep in contact with that leader, being ready to strike at the merest twitch or hesitation. The first lesson to be learned by the stillwater angler trying river nymphing is where to fish his flies. Let’s look at a pool on my favourite Derbyshire Derwent as an example, which we nicknamed the Dub. It’s not the easiest place to fish but always holds trout and grayling. In the true sense of the word, the Dub could hardly be classed as a pool or run. It is in fact a short, deep, treacherous scour on the river’s right bank, backed-up by an equally deep back eddy on the left bank. But it’s the type of place you need to learn to fish. The power of the current running through the Dub is generated by two factors. First, the water approaching the Dub runs down a steepish gradient from where it empties into the pool. The river is then divided into two by a sizeable gravel island with at least two thirds of the river being channelled and compressed through the pool. The resident trout of the Dub all lie in the placid current of the back eddy, just on the other side of the raking current of the scour. This type of swim can be found up and down the country in fast-flowing, freestone rivers (see diagram). These fishy-looking back eddies are always a headache to fish, and often protected by a deep rip between the angler and the bank, plus dense bankside vegetation. The trout enjoy a lot of natural protection, which you the angler must learn to overcome. LET’S look at the problems to be solved. The first one is how to present a nymph close up to the far bank, and then fish it through without the fly line being caught up and dragged downstream by the intervening rip current. The first thing you must do is wade as close as you can to the edge of the steep drop-off and rip current so that you can stay in contact with your flies. But be careful with your footing. The rod must be held as high as possible to prevent the fly line from touching the rip current and dragging the nymph or wet flies away downstream in the wrong direction. The angler follows the fly line and leader round with the rod. If the line hesitates or behaves unnaturally, the rod should be lifted. This method is called “drifting on the drop” and can only be performed in this type of swim when the river is at perfect summer level. An extra inch not only disrupts the flow, but makes the swim much harder to access and present the flies correctly. So how do we achieve this? Standing opposite the centre of the back eddy, a cast is made to point one (see diagram above). With the rod at 45 degrees and arm fully extended, let your nymph or wet fly sink. They will then automatically pivot and be drawn into the gentle current of the back eddy to point 2 which runs parallel to the rip of the scour. It helps to leave a large loop of fly line hanging below the reel which can be fed out if necessary as the leader progresses from right to left in the back eddy current, letting the nymph drift unhindered with the current. At almost any time between points two to five, a take can be expected. Keep your eyes peeled because you won’t detect a take by feel alone. The detection of the takes is part visual/part sensory. Sometimes, the belly of the line just seems to feel heavier. That’s all you’ll feel. It’s almost like having a sixth sense. The solid resistance of a trout hooked deep down in the back eddy of the Dub gives one a true sense of achievement, as well as endorsing my belief that the leaded Pheasant Tail is one of the most effective river patterns of all. Early season finds the trout quite reluctant to move very far to intercept drifting food. Therefore the closer and slower you can present your artificial, the more chance you have of one of them taking it. To achieve the depth, I use a 14 to 15 ft leader armed with two large Pheasant Tails dressed on longshank size 12,10 and even eights, loaded with lead wire wound on to the hook shank for the full length of the thorax. On the dropper I would mount another weighted PT Nymph dressed on either a size 12 or 10, or a size 12 Wee Silver Nymph (Franz Grimley), weighted with a Goldhead Gold-Ribbed Hare’s Ear on the point. However, when the water warms up and the trout move higher in the water table, I substitute the weighted dropper fly for either a silver Butcher with a fluorescent fire orange tail, a winged wet Greenwell’s or even that old loch and reservoir favourite, the Soldier Palmer. That fly may sound a bit strange, but if you saw some of the stomach contents of Derwent trout you would understand my reasoning. WHEN nymphing, always thoroughly degrease the leader first, so that it sinks immediately on contact with the water along its entire length on the very-first cast. If you haven’t got any Fuller’s Earth paste (Fuller’s Earth and washing-up liquid mixed together) you can always use some bank-side mud. You want that first cast to fish correctly. It’s also important to ensure that the flies sink, and the only way to do this is by holding them under the surface and squeezing them repeatedly until the water gets into the very fabric of the fly or nymph. Sometimes even leaded flies can take a bit of sinking if they are not thoroughly soaked. This is especially true where a lot of dubbed fur is incorporated into the dressing. I NEVER use a sink-tip, intermediate or slow sink line to get my flies down close to the bottom. Instead, I go for a floating line, longish leader and flies designed to sink slowly. However, simply casting across the stream and allowing it to swing round and across the current will serve only to bring even the heaviest pattern to the surface, where it will skate ineffectively in the top as it comes round on the current. You need to be able to “mend” the line. A “mend” is a loose loop of fly line which is flicked up, or sometimes down, the stream so that the business end of the line and leader can run free with the current for a longer period of time. This allows the heavy nymph, shrimp, bug or other patterns time to drop to an effective fishing depth. The idea behind the upstream mend is to momentarily defeat the drag of the current against the fly line, leader and flies. Start by casting fairly square across the flow of the current. Then, immediately throw an upstream mend into the fly line. Then with the rod held out over the main flow at 90 degrees, the fly line is allowed to straighten. Quite often, in a strong current, I will mend my line upstream as many as four times. Each mend must be fed from a large loop of line hanging below the forefinger and reel. At no time should the fly line be jerked or tightened during the shooting of the upstream mends. Following the fly line round with the rod tip helps the nymphs maintain an effective fishing depth by reducing the full force of the current against the leader. Having made the final mend, the current is allowed to tighten the L-shape in the line. 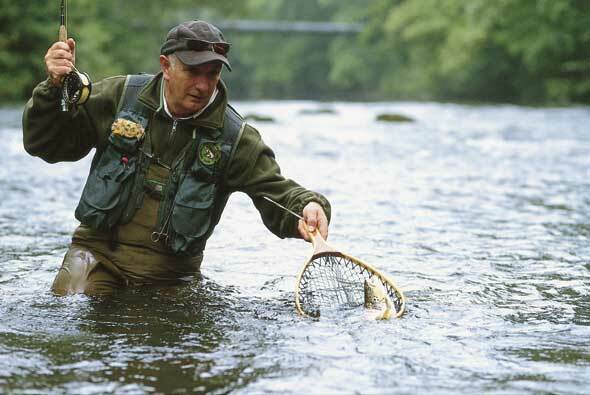 The forward part of the fly line and leader will now “swim” for a short distance across the flow of the current, ensuring the nymph fishes close to the bottom and across the vision of the trout or grayling. This action often produces a take, but it may feel no more than just a heavy sensation. After completing the final mend and shoot, hold the rod well out over the water to let the current tighten the line, which hangs virtually straight downstream. But the bend in the line from the first mend is suddenly caught-up by the current and rolls out to conform with the rest of the fly line. It is this rolling out of the bend which makes the nymph suddenly come to life and seem to swim away from the bank towards the open river, often producing a take from a trout or grayling. Once the nymphs are fished out, and the fly line hangs at rest directly downstream, move a foot or two downstream yourself and repeat the process. This cast and walk becomes a routine, broken only by the playing of a fish. Don’t expect a vicious pull or tug. Often the only signs that a fish has taken the nymph will be the line stopping, or drawing away in the opposite direction to the sweep. As you work your way steadily down the pool, the water will start to deepen, making it necessary to add extra mends into the line. There’s nothing magic about mending the line. But it’s a technique you have to learn to successfully fish rivers. ALL pools are different on the river. Some fast and shallow; others wide and deep. And all have their problems to solve. One of my favourite pools on the Derwent is some 200 yards long, with the trout tending to lie along the far bank in water of four feet or more. To add to the problems of reaching these fish, the far bank is very heavily lined with mature trees, a common situation on the Derwent. The conventional down and across approach is also not the answer because many of the trees reach over the water and are too low to cast underneath. However, I worked out a strategy for putting my nymph to where the fish are lying. First I wade out on to the bed of sloping gravel in mid-stream, positioning myself slightly upstream of a gap between the trees which allows the nymph to drop right up against the far bank. After casting, I throw a large upstream mend in the fly line while, at the same time, allowing a yard or so of line to shoot through the rod rings. This produces a sharp angle between the leader and the line which has been shot upstream. I then pause to allow the line to float undisturbed downstream. Then as soon as the belly of line, created by throwing additional fly line into the initial “mend”, arrives opposite where you are standing, I shoot another large belly upstream, taking care not to disturb the angle produced by the first mend. This upstream mend and shoot can be performed as many times as necessary. After completing the final mend and shoot, the rod is held well out over the water while the current tightens on the line. Now the bend produced by the first mend comes into play, whipping the nymph round in a trout-attractive manner. Most trout taken on this method have been hooked firmly in the jaw or the scissors, which seems to prove that the trout have followed the nymph across the current, taken the nymph, and then turned back towards the cover of the bank. As with other pools, you move slowly downstream, adding extra mends and shoots with every cast. This allows you to gradually search the far bankside water well downstream under the trees where few other anglers’ flies have reached. The only risk is that eventually the nymph is liable to snag the bottom or tree roots. If this happens, move on to the next gap in the trees and repeat the mend and shoot routine all over again. THE current supplies the vast majority of the river trout’s food. But they will forage around for other grubs like freshwater shrimp, nymphs, larvae, bullhead, minnows and even small grayling. So the angler needs to study the current of every pool, riffle and glide. However, a trout doesn’t want to work too hard at maintaining its position in the current just to capture its lunch. So there has to be a happy medium. Trout appear to use the current in different ways to how we imagine. Many times on the Derwent, I have regularly taken trout in water so fierce that you would never believe a fish could hold station in it. One of my favourite pools has a natural weir at its downstream end where the trout hang in the fast, turbulent water just upstream of where it spills over the sill and into the pool below. And I think I know why. Having spilled over this natural weir, the main flow pushes hard and strong into the pool, creating a buffer zone between the back eddies and the rip that is favoured particularly by the grayling. A string of submerged rocks immediately in front of the weir sill create a “stopper” wave, or another buffer zone, beneath the surface rip where the trout can “hang” comfortably on the fin until something edible passes by. Trout like to hover between two currents that “rub shoulders” with each other. I fish the main rip in the traditional “down and across” fashion, allowing the fly line and leader to come to rest in the fold of current between the rip and the back eddy. One particular day I decided to figure-of-eight my fly line back up the “crease” in the two currents, and in no time I was playing a chunky grayling. This proved to be no fluke. Since then I’ve had stacks of grayling and trout from the same place. Top fly for this situation is Franz Grimley’s Wee Silver Nymph. Remember that grayling have a much smaller mouth than a trout of similar length and, despite their willingness to rise, if they have difficulty getting the fly into their mouth you won’t hook very many. Even when you’ve got the “right” fly on the leader, you can still experience a lot of missed rises. The nearest explanation Ican come to after watching them rising at close quarters for years is that they are too fast for their own good. A surface-feeding trout “hangs” on the fin, usually around mid-water or just under the surface, and rises leisurely through the water column to intercept surface prey. The grayling, on the other hand, will more often than not lie in a shoal over a gravel bottom from where they launch their Polaris-like ascents at the target prey. They are literally “up and back down” before you can blink. So is it any wonder that they drown more flies than they can take into their mouths? Another fascinating aspect of the grayling is how they home in on your feet as you slowly fish your way down a “shallowish” gravel bottomed glide. They are there to snap up the shrimps and nymphs that you disturb as you shuffle downstream. A good pair of polarising glass is always a good investment. Not only will they let you see better underwater but they might save you from losing that precious eyesight. Nymphs: Pheasant Tail size 12-8; Wee Silver size 16-12; Goldhead Gold-Ribbed Hare’s Ear, Bob’s All-Gold, Prince Nymph size 14-8; Mayfly Nymph size 10-8; Cased Caddis size 14-10. Wet flies: Silver Butcher size 12/10; Greenwell’s Glory size 14/10 (winged wet and hackle variety); Shrimp size 14/10; Silver March Brown size 14-10; Soldier Palmer (slim dressed); Partridge & Orange size 14-12; Ginger/ Olive Quill. The Silver Butcher, one of Bob's favourite wet flies (left).